What is a niho stone, and how heavy is it? Why did the builders gather stones at low tide? 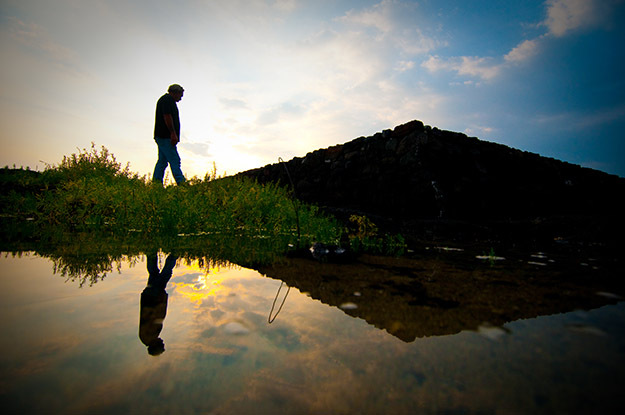 What happens to a sacred site, like a heiau, if it is not taken care of for many years? 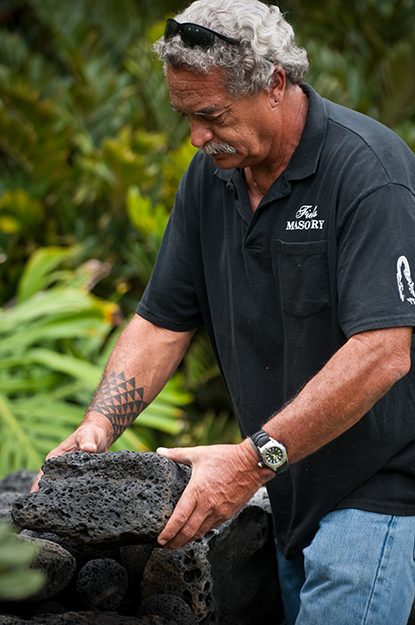 How are today’s calendars different from the calendar method of the Hāpai Aliʻi heiau? In today’s fast-paced world, how important is it to learn and use Hawaiian building techniques from the past? In the neighborhood and town where you live, are there any stone structures made from the uhauhumu pōhaku method of drystacking (no cement)? Are the structures intact? What are the advantages of using this method? Ever tried using stones to build a small figure or wall? How long did it remain standing? Building with natural materials is harder than it looks. Ka poʻe kahiko, the people of old, became masters of uhauhumu pōhaku, or dry-stack stone masonry. Using only stone, strength, intelligence, and gravity, they created elaborate structures, some of which are still standing today. Compared with continental landmasses, the Hawaiian Islands are young. 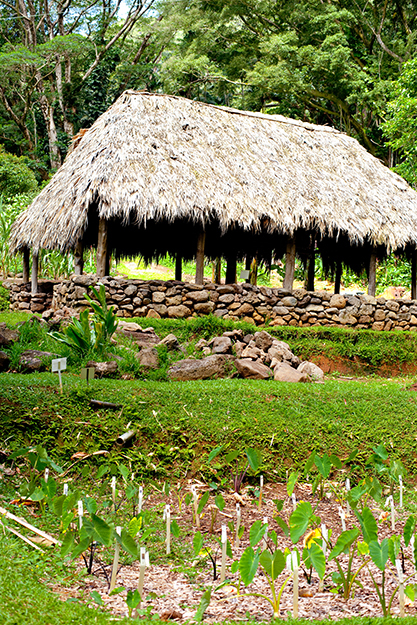 Hawaiʻi has no metals and very little clay for making tools and structures. In Hawaiʻi, the hardest natural resource available to Kānaka ʻŌiwi (Hawaiians) is pōhaku, or stone. According to traditional Hawaiian thought, pōhaku are living things with mana (life force), not inanimate objects. Pōhaku were used to build structures and to make the tools necessary for Kānaka ʻŌiwi to thrive. 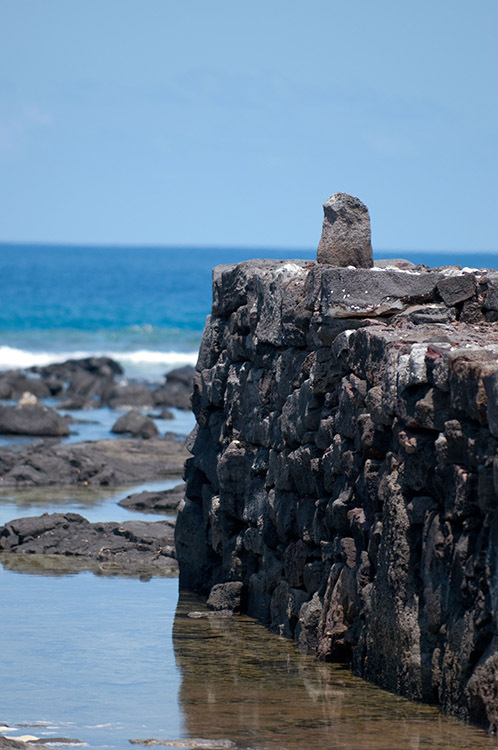 Stones provided a solid foundation for many structures in Hawaiʻi, such as large terraces, walls, and platforms. 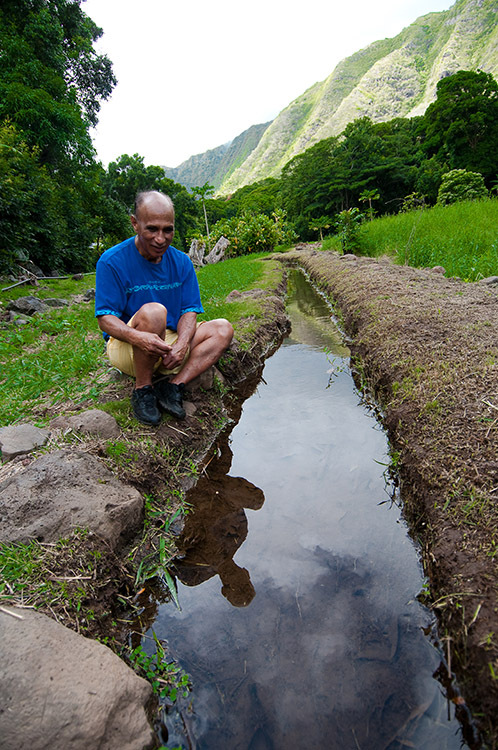 Loʻi, or wetland taro patches, also made use of pōhaku, as did the ʻauwai, or irrigation ditches that provided water for the loʻi. Kānaka ʻŌiwi also worshipped special stones as akua (gods). Some stones were carved, and others were left in their natural form. There were special classes of kāhuna (experts) who specialized in pōhaku. Some religious structures were more than 40 feet high, 120 feet long, and incorporated thousands of tons of stone. In some cases, the pōhaku for a structure were carried or passed from hand to hand in lines that stretched for miles. Many famous structures, like Puʻukoholā heiau in Kohala, Hawaiʻi, took years to complete. The term for this kind of rock construction is uhauhumu pōhaku (traditional Hawaiian dry-stack stone masonry). ʻO ke kahua ma mua, ma hope ke kūkulu. Learn all you can, then practice. Today there are wahi pana (storied places) built of stacked stone that are more than a thousand years old. No cement, mortar, or additional reinforcements were used. Many of these wahi pana have remained standing through earthquakes, tidal waves, and even hurricanes. The reason for the durability of these structures is the Kanaka ʻŌiwi engineering technique of uhauhumu pōhaku. The first step of uhauhumu pōhaku is to identify an appropriate site for construction. Traditionally, this was decided by the kahuna kuhikuhipuʻuone. Many factors were considered—the gradient of the ground, the surrounding structures and resources, the position of the structure, and the mana of the place. Historical events, famous people, and natural phenomena helped to determine the site's mana. Once a site was chosen and the structure was designed, the paepae, or foundation, was built. The paepae is started by placing large anchor stones called niho (teeth) in strategic places. The niho help to secure the rest of the stones as they are carefully fit together like pieces of a puzzle. Each stone is placed at a slight angle facing inward. After the larger stones are positioned, smaller stones are added to backfill the spaces around the interlocking pōhaku. This method is the key to the engineering technique of uhauhumu pōhaku. Any disturbance moves the stones inward, making a tighter fit and a stronger structure. Many of the stones that were used in the construction of Puʻukoholā Heiau are believed to have come from Pololū Valley. It is said that Kamehameha and his men formed a human chain nearly twenty miles long and passed the stones from person to person all the way to the temple site in Kohala. Ko luna pōhaku nō ke kaʻa i lalo, ʻaʻole hiki i ko lalo pōhaku ke kaʻa. A stone that is high up can roll down, but a stone that is down cannot roll up. When a chief is overthrown his followers move on, but the people who have lived on the land from the days of their ancestors continue to live on it. kū paʻa kiʻekiʻe ā! Standing tall and firm! Over the years, particularly since the arrival of Westerners in Hawaiʻi, many famous wahi pana that utilized uhauhumu pōhaku were destroyed. Sometimes stones were taken from wahi pana for other uses, like making walls for ranches. Sometimes entire structures were leveled to make way for new development. Fortunately, certain sites have been preserved by various communities. Today, more and more communities are not just preserving wahi pana but are also restoring them. This practice has helped bring back the art of uhauhumu pōhaku. Many heiau (places of worship) and agricultural systems are being restored so they can be utilized for cultural and educational purposes, not just for their aesthetic or archeological value. Uhauhumu pōhaku is also being used to build entirely new structures to meet the needs of different communities. Uhauhumu pōhaku has also been used to make political statements. In 2006, during a protest against genetically modified kalo (taro), an ahu, or shrine, was built on the front lawn of the university president’s office at the University of Hawaiʻi at Mānoa. The purpose of the ahu was to oppose the genetic modification of kalo and to emphasize the genealogical connection between Kanaka ʻŌiwi and Hāloa, the first kalo plant. Uhauhumu pōhaku uses natural materials and works with the contours of the land. Like many Hawaiian practices, it is sustainable and causes minimal impacts to the natural environment. Uhauhumu pōhaku reflects the wisdom and ingenuity of our ancestors. It also demonstrates how Kānaka ʻŌiwi view the land and our relationship to it. The continuation of uhauhumu pōhaku is therefore important in maintaining a Hawaiian sense of place. Learn more about uhauhumu pōhaku in the following video.